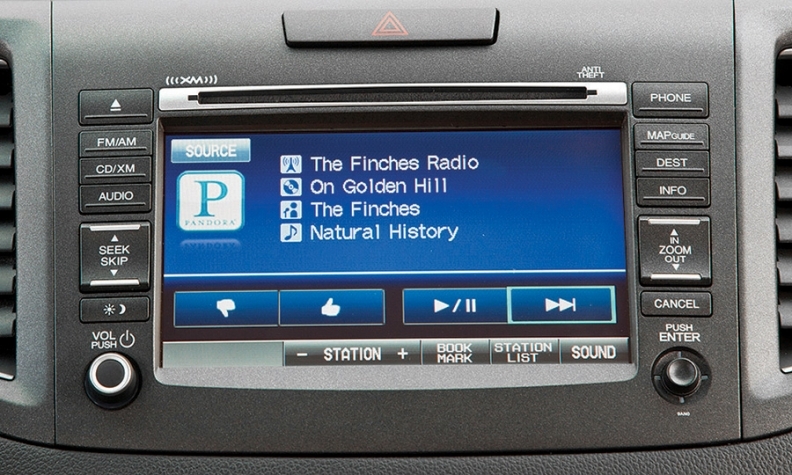 Pandora, offered by 23 car brands, is emerging as the dominant internet radio app for motorists. TRAVERSE CITY, Mich. -- Why are automakers so eager to offer the latest music, navigation and other infotainment features to consumers? First, the obvious: Motorists want them. But in addition, data collected from infotainment services might generate significant revenue, said Andreas Mai, a director of product management at Cisco Systems Inc.
Data harvested from an infotainment system reveals a motorist's usage patterns, such as which radio stations he listens to, how he uses his onboard navigator, how he drives his car and where he parks it. Mai estimated that data from one car's infotainment system could generate a total of $1,400 a year in revenue and savings for the motorist, app developers, automakers and dealerships. For instance, a motorist could save money by spending less time in traffic jams. App developers could earn revenue by providing traffic guidance and parking information. Cisco is a $46 billion technology giant that produces the routers, switches, servers and software that connect Web sites to computers, tablets and smartphones. That is why Mai wants to help automakers exploit infotainment data. Motorists might refuse to grant a car company blanket access to the data, Mai said. They would likely be more willing to trade discrete chunks of data in return for something of value. So if an insurer wanted to study a vehicle's speed, it could offer a 30 percent discount on car insurance. Or if a dealership wanted to display a customer satisfaction survey on the console screen, it could offer a $20 discount for the next service appointment. "You need to customize these services so that they are not annoying," Mai said. "You cannot have pop-up ads in your vehicle. That's not a viable business model." Mai said Amazon and Pandora are good role models because they have learned how to analyze their customers' data. Amazon will study a customer's online book purchases, then recommend two or three other books she might like. Pandora, which provides streaming radio to smartphone owners, modifies its song selection as the user offers thumbs-up or thumbs-down verdicts. Pandora and Amazon "are extremely good" at analyzing customer data, Mai said. Amazon has become the world's dominant online bookseller, while Pandora, which is now offered by 23 car brands, is emerging as the dominant Internet radio app for motorists. Mai expects a similar consolidation of other infotainment apps such as real-time traffic updates, parking, navigation, etc. That would speed development of new services and be consumer friendly, he said. First, with consolidation motorists would see familiar apps no matter which vehicle they were driving, Mai said. Second, industrywide apps would enjoy economies of scale for the developers that aren't available for specialized apps limited to one automaker -- even if it were a major player such as Volkswagen, General Motors or Toyota. Each of them is selling about 10 million vehicles a year globally. By contrast, smartphone developers make apps for a pool of about 75 million Google Android users just in the United States. But Mai does not believe those dominant apps will emerge as a result of an industry-backed organization such as the Car Connectivity Consortium, which is developing common infotainment standards. Instead, certain apps will create a de facto industry standard because consumers like them best. As the infotainment world develops, automakers will find themselves in an uncomfortable role as gatekeepers. They will determine which app developers will gain access to the car owner's Big Data, but if the automakers try to maintain a stranglehold on the data, they will stifle innovation. "Everybody is working on this very secretively," Mai said, "but nobody has the silver bullet. The question is: Who can control this? I don't think the automakers will be able to. It's too fluid."